This battery-operated cordless Sonic Cleaner gets dental appliances, clear Essix retainers, clear aligners such as Invisalign-type, Hawley Retainers, mouthguards, and other dental appliances sparkling clean in 3-5 minutes. Used in conjunction with Retainer Brite cleaning tablets or Dentibrite Cleaning Crystals, the Cordless Sonic Cleaner cleans deep, at 5800 waves per second, where brushes can’t reach. To use with Retainer Brite tablets, fill the resevoir with warm (not hot) water, add your dental appliance, drop in one Retainer Brite tablet, and close the lid. Switch on the Cordless Sonic Cleaner and leave for 15 minutes to deeply clean your appliance. After 15 minutes, switch the unit off, drain the resevoir of all liquid, and rinse your dental appliance with clear warm water. Measures only 4 inches square - pack it in your suitcase when you travel! Batteries are included. Please understand that this item is not returnable due to heath regulations. However, if you have a question or a problem with your cordless sonic cleaner, please contact us for help. Note: Unit is sonic, not ultrasonic. Watch our video: How To Use Retainer Brite Tablets which shows the Cordless Sonic Cleaner in action! Invisalign® is a registered trademark of Align Technology, Inc. Retainer Brite is not sold at Target, Walmart, CVS, Walgreens, Rite Aid, or Kmart. It is only available online at DentaKit.com. This sonic cleaner does NOT shut off automatically; you need to shut it off after 15 minutes. (If you want a sonic cleaner that DOES shut off automatically, we recommend the SonicBrite Kit. 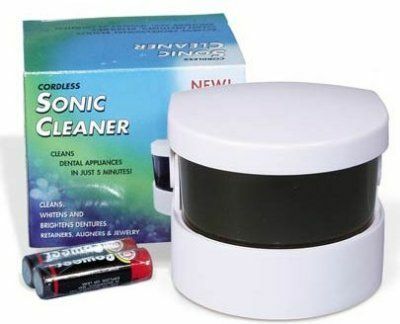 Its sonic cleaner DOES shut off automatically, but that sonic cleaner is not sold separately; you get it as part of the purchasing the whole SonicBrite Kit.). This sonic cleaner is sold separately. It is not included with Retainer Brite. For cleaning dentures, we recommend the SonicBrite Kit and its larger sonic cleaner. This is a handy little tool which helps Retainer Brite and other retainer cleaning products to penetrate deeply into the crevices of your retainer. It vibrates at 5800 waves per second, at at 4 inches square, it's easy to pack in your suitcase or take to work. Can this be used with just plain water? You can just use water if you want, but it won't effectively clean your retainer or dental appliance unless you add a product such as Retainer Brite, Dentibrite, etc. This device is sonic, not ultrasonic. Does it come with tablets? If so how many? The Cordless Sonic Cleaner is sold separately from Retainer Brite and does not include any retainer cleaning tablets. This is an amazing cleaner! I use it with the cleaner packets that are sold separately . Does an great job getting my retainers clean and fresh!! You can tell as soon as the cleaner's button is turned on that the sound waves are activating the Retainer Brite tablets to work harder. I wish I had both the Retainer Brite tablets and this sonic cleaner when I was a kid with a retainer, b/c honestly brushing it, just never seemed sufficient enough to clean. Thank you so much for this product for my son. ProsEasy to use & you feel that you really are thoroughly cleaning your retainer (or whatever dental appliance). ConsThis would be more convenient if this turned off automatically after 15-20 minutes. well with retainer brite tablets. ConsTry to keep the battery compartment dry. It's great for cleaning my trays.Specially when used with the retainer brite. The only problem is that it is not heavy enough and moves as it works. I have to surround it with heavy items when it works. This works well to clean the kids clear retainers. It's quite and easy to use. It does tend to move around on the counter top while it's on, but I solved the problem by sitting it on a bathcloth. Overall I feel it was a good purchase. She uses Aquafina bottled water to just "rinse" the retainers at the sink in the morning and "soak" them during the day in the single blue container. This Aquafina water is best for this type of presoak because we test it to be 0%...just like the Zero Water that we also use for our water kettle and for drinking...NO calcium buildup or corrosion-causing effect on anything! After school, she uses the warm tap water/Brite tablet/U.Sonic Container - with auto turn off - per product instructions, while she unpacks and gets resettled. Her iPod is set to match the 15 mins. alarm, so she can independently retrieve the sparkling items, rinse and store them for the night use. Before buying these products, I daily cleaned with a small soft t.brush, a dab of Palmolive soap, cold tap water, then soaked them in the filtered water mentioned above. Annoying! Grfather was using the same old routine for his orthodontics, and has been thrilled with these (shared) products. Warm tap water/a Bright tablet/Sonic Cleaner with the auto shutoff = a Done Deal. He loves the Cleanse Freshen Go wipes which he keeps on hand, daily, as needed. Ha! Today I've purchased his very own products = one happy woman (me). Hopefully I've helped with the sharing! This site has other useful items. ProsSonic devise is of solid construction, good appearance, very easy to clean, not loud. Tablets & powder perform as advertised. Cleanse Freshen Go Wipes are excellent accessory. Had quite a build up on my Invisalign retainers. Product has removed it and is easy to use. ProsEasy and works well. Great price. Shipped quickly. ConsUltrasonic device is a little loud. Your products saved me $hundreds! One morning I took out my invisiline retainer and it had turned solid white! I called my orthodontist and they said "sorry, there's no way to fix that, but we can make you another one for $100!" I decided to search the internet and found retainer before and the sonic cleaning unit. Other posts noted it may take several times soaking and scrubbing, so I was prepared with baking soda and my sonic toothbrush. After 3 soaks in retainer before in the sonic cleaning unit, I saw clear areas! I repeated this process 7 times including brushing and I'm thrilled to say my retainer looks new again! My portable sonic cleaning unit arrived with a multi fracture crack in the soaker cup. A quick email to the Dentakit company and they responded saying another whole unit was on its way, no need to return the broken one! I'm sticking with Dentakit and firing my orthodontist ! This product works great and is very inexpensive. I got this this Sonic Cleaner recently for my daughter to clean her retainer; it works well and so far we are very happy with this purchase. I've used the sonic cleaner for a week now and so far so good. It's easy! Just drop the tablet in warm water, set the timer on my phone for 20 min and get ready for work in the morning. I wear Invisalign braces and couldn't stand the white film that builds up after just a few days of wearing. I noticed a bit of film starting to develop this morning after a week of sonic care but was able to brush it off with just a soft toothbrush and water after rinsing off the retainer brite solution. The sonic cleaner is small, quiet enough, and I keep it in a corner on my counter so no movements or getting away at all. I would recommend! ProsInexpensive and worth it to keep alingers clean. The item is effective and reasonable priced. Compact size makes it ideal for travel. This cleaned my daughter's clear fitted retainers beautifully. It is super easy to use and really gives them a fresh clean feel. Merchant Response:It won't clean on its own. You need to add a product like Retainer Brite, SonicBrite, or DentaSoak for it to do the job properly. This is clearly explained on the product page for the Cordless Sonic Cleaner! I am extremely disappointed with this product. It came with very little information, I don't know what its supposed to do or how long. It is very noisy, does nothing but vibrate. I have no idea what the "sonic" part of this unit is. Merchant Response:We're sorry that you were disappointed! The "sonic part" of the product is the sound waves produced by the vibration. There are no instructions because you are supposed to use it with Retainer Brite Tablets, which means that you fill it with warm water, drop in your retainers and one Retainer Brite Tablet, and then run the cleaner for 15 minutes. I am a senior citizen who redid her long ago braces for cosmetic reasons. Happy with the end result; but as we all know you must wear the retainer to keep your teeth straight. I was doing this and brushing the retainer, sometimes cleaning with diluted peroxide and water, or mouthwash for it to sit in after cleaning, or diluted white vinegar. All helped for a time, but eventually the retainer just didn't feel clean. I read the reviews on this cleaner and thought "not much to lose" and ordered it along with 2 years supply of the tablets. Using it religiously and VERY HAPPY with it. It performs exactly as stated. I watched for it to walk on the counter and it didn't, so no problem there. It is so easy to set it up and have it running as you make the bed and get dressed in the morning and putting on your face. Rinse, dry and put away as you are tidying up the bathroom and don't give it another thought until the next morning. PERFECT! Wish I would have started with this cleaning solution to begin with. The cleaner is not too noisy, you are just aware that it is running. Perfect for travel. It made my dentures so clean. Just love it! ProsIt made my dentures so clean. Just love it! This cleaner is so easy to use. I really like it. I love the compact size, ease of use, and it really gets my TMJ retainers/guards sparkling clean. ConsUses batteries instead of having a power cord. Really helps keep the retainer free of plaque. Find that this little machine enhances the cleaning capability of the cleaning tablets that I use for my Invisalign Trays. So glad to have come across this item! This is fantastic for cleaning retainers! I use the Sonic Cleaner each morning and find it very convenient. It does a nice clean job on the retainer. The unit itself is easy to keep clean. So far there are no problems with it. I am very pleased with it.